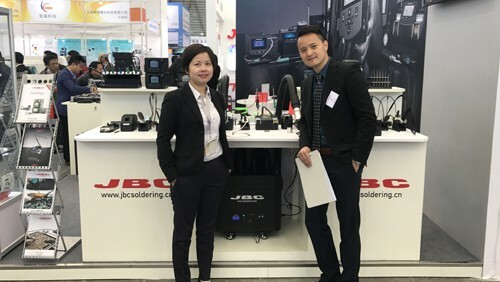 Pictured left to right: Indium Corporation Area Tech Manager for Eastern China Wisdom Qu; and JBC Soldering Tools China Sales Manager Billy Shen at Productronica China 2017. Indium Corporation will demonstrate its low-voiding solder products "Live@NEPCON South China" at NEPCON South China from August 29-31, in Shenzhen. Live@NEPCON South China is a joint effort between Indium Corporation and industry partners to accurately and honestly depict the performance of the company's materials in real time. The program places Indium Corporation products into live equipment demonstrations on the show floor. This year's featured partners are JBC Soldering Tools, ASM Pacific Technology, and Shenzhen Pachda Automation Co., Ltd.
Live@NEPCON South China benefits Indium Corporation, partners on the show floor, and, most importantly, the customer, who is be able to see and experience the equipment and materials in a live-action environment. Since 1929, JBC Soldering Tools has been at the forefront in developing soldering and rework tools for electronics professionals. JBC is now a worldwide renowned brand offering a wide range of products specially designed to meet every operator's needs and applications. JBC has headquarters in Barcelona, Spain, and branches in St. Louis, MO, USA; Guadalajara, Mexico; Hong Kong; and Shanghai, China – guaranteeing quick and efficient service with a distributor network covering the five continents. For more information, visit www.jbcsoldering.cn or www.jbctools.com. ASM Pacific Technology is the world's first equipment manufacturer that can offer technologies and solutions for all process steps in electronics production from backend–chip assembly, bonding, and packaging–to SMT processes. The backend and SMT solution segments complement each other and benefit from synergies in technologies, development, sourcing, and global presence. The latest advances in integrated systems on the chip level–PoP, SiP/hybrid, WLFO, embedded PCB, etc.–further support these synergies, demonstrate the outstanding strategic position of the company and expand its role as a technology partner with process know-how and solutions for all areas of electronics production. For more information, visit www.asm-smt.com.